The Miami Heat look to get the Sixers back after they got embarrassed in their own home Thursday night. Things came to a boiling point when Sixers' Justin Anderson went at it with Dwyane Wade, the hero of game 2. Miami split the series by taking it to Philadelphia and the Sixers responded in game 3 to steal back home court advantage. The return of Sixers' Joel Embiid changes the dynamic. Hassan Whiteside has been a ghost and it's clear that Kelly Olynyk (-20) and Justice Winslow (-27) are incapable of holding down the fort. The Sixers are significantly more talented and they won game 3 by outscoring Miami 32-14 in the fourth thanks to strong play from Ben Simmons: 19 points, 12 rebounds, and a game-high +24. If Miami is to even it out, they'll have to maintain the physicality but play more efficiently. Wade will once again have to put in a "vintage" performance while James Johnson (-19) should help to contain Simmons and Marco Belinelli, who has been a spark plug off Philly's bench. Nobody can stop Embiid and Philly outrebounded Miami 53-45 and outscored them in the paint 36-22. But before losing on Thursday, Miami had won seven straight home games versus the Sixers and at the risk of going down 3-1 heading back to Philly, expect them to put in their best performance and win another gruelling battle. History is being made as the New Orleans Pelicans are on their way to sweeping the Portland Trail Blazers. Superstar big man Anthony Davis is averaging 28.3 points, 12.7 rebounds, and 2.7 blocks for the Pelicans but the story has been about the backcourt: guards Jrue Holiday and Rajon Rondo are playing masterful basketball against the Blazers. The Pelicans are up 3-0 against the Blazers thanks to Holiday and Rondo shutting down the Blazers' backcourt of Damian Lillard and C.J. McCollum. An All-NBA First Team favourite, Lillard is averaging just 18.3 points on 32.7 per cent shooting while having more turnovers (15) than assists (13). Rondo is averaging 12.7 assists per game while Holiday is scoring 23.3 points on 53.4 per cent shooting. If the Blazers hope to survive, Lillard will have to find his All-NBA form and fast because the Blazers are getting owned in almost all facets of the game. The Pelicans had more assists, fewer turnovers and dismantled Portland on the fastbreak outscoring them 32-13 while also pounding the paint with 62 of their 119 points in game 3. The Pelicans will continue to roll. They are 5-1 ATS in their last six when playing Portland and are 4-1 ATS at home against them. They will make history with their first-ever playoffs sweep and become the first team to make the second round this postseason. It was a role reversal for the Houston Rockets in game 2. While their MVP James Harden carried them in the first, the team returned the favour and carried Harden en route to a blowout victory versus Minnesota. Harden had a horrific game only making two of his 18 field goals and a single trey in ten attempts. 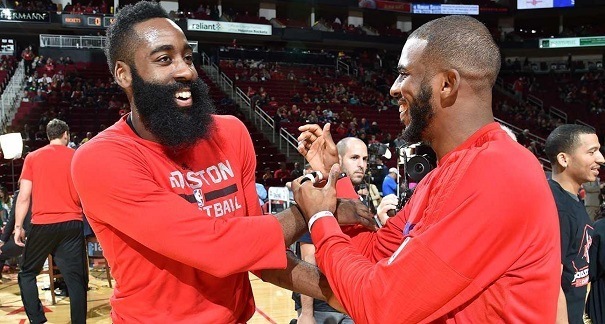 Thankfully, fellow superstar Chris Paul was there to rally the Rockets. Paul scored a game-high 27 points to go with eight assists and three steals. His +21 rating was third-best. Centre Clint Capela continued to be a monster with 16 rebounds and a +22 rating while Gerald Green was huge off the bench with 21 points, five three-pointers and a game-high +27 rating. Beyond these three, the Rockets shot terribly and only hit 36.5 per cent of their field goals. Yet they still dominated. Houston limited Minnesota to just 38.8 per cent shooting and a measly five three-pointers made. They forced them to commit 16 turnovers to just 15 assists. But despite shooting poorly, Houston hit 11 more threes than Minnesota and that turned out to be the difference. Heading to Minnesota, Houston is 6-0 against them and 5-1 ATS this season. The Wolves will have the fire they lacked in their last game and they will look to be more aggressive. But Houston is still better defensively and they showed that even if they shoot poorly, they have the tools to dominate Minnesota. Houston takes this and moves one game closer to the second round. Some series are on their way to ending but not this one. The Utah Jazz and Oklahoma City Thunder could be in for the full seven games. They split their last two games and went at back-and-forth like a true slugfest. In the end, the Jazz edged the Thunder thanks to a 28-16 fourth quarter. Going back to Utah, they have a chance to lead the series. Jazz rookie Donovan Mitchell dropped 28 points on OKC despite missing all seven of his three-pointers. He, along with Joe Ingles (who was a game-best +21 despite only scoring three points) shut down Paul George and the Thunder big three. George, who was the hero of game 1, only hit six of his 21 field goals. Him, Carmelo Anthony, and Russell Westbrook combined to hit just 19 of their 58 attempts (32.76 per cent). Utah's elite defence was on full display and they shouldn't slow down at home where they are 28-13. The two teams have alternated covering the spread but the lean is on Utah here. Their frontcourt of Derrick Favors (20 points and 16 rebounds) and Rudy Gobert (13 points, 15 rebounds, and 3 blocks) will continue to come up huge against a thin OKC frontcourt. The Jazz outrebounded Utah 56-46 in game 2 and made 11 more free throws than OKC despite being the visiting team. Expect a more complete performance from Utah as they take game 3.